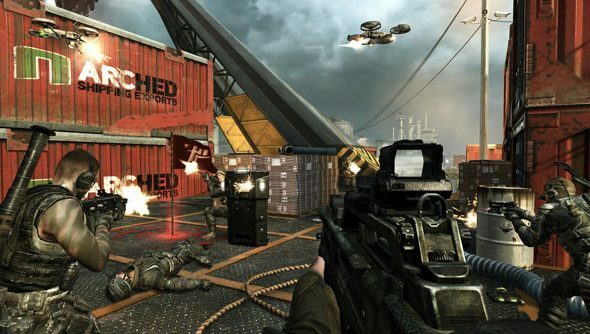 Treyarch’s David Vonderhaar been flicking tiny scrunched up bits of Black Ops 2 multiplayer info at the One of Swords podcast, revealing a few new details about the shooter’s competitive spirit, its livestreaming potential, the ability to swear from beyond the grave and its unlockable looping perkiness. Game design director David Vonderhaar mentioned that “Revenge Voice” is making a comeback, meaning you’ll hear a gratifying snippet of (presumably filthy) audio from your enemy’s microphone as they perish. The Emblem Creator was also confirmed to reappear, this time with added layers and a wider colour palette, for prettier phalluses. Not reappearing is any form of Second Chance perk that would allow a defeated player to continue firing from the floor – though the revive mechanic will still live on in Black Ops 2’s zombie mode. Infinite Sprinting perks are also removed. Killstreaks are out, as we reported a while back. Scorestreak rewards will “loop” (that is,once you receive the maximum reward you’ll start again at the bottom of the chain), though scorestreaking players will only ever receive one of each type of reward. Vonderhaar gives the UAV as an example: if you haven’t called in or activated that reward, you won’t get a second one. CoDCasting (Treyarch’s brilliantly obvious term for built-in livestreaming of CoD games) on PC is still being worked on, but will work with Kinect on Xbox and PS Eye on Playstation. Watch this video for now though, which demonstrates the kind of options and features soon to be available to CoDCasters, from the obvious such as switching to a map view, to toggling individual HUD elements. Esports! Check out the full interview with One of Swords for more details. David Vonderhaar’s bit begins around the 24 minute mark, but why not listen to the whole thing? They all sound like nice people.